1Faculty of Chemical, Petroleum and Gas Engineering, Semnan University, Semnan, Iran. 2Chemical Engineering Department, Babol University of Technology, Babol, Iran. Multiwalled carbon nanotubes (MWCNT) were found to be an effective separation media for purifing CO2 from O2. Significant uptakes of CO2 and O2 were measured at 288 K, 298K and 308 K over the pressure range of 1 to 40 bar using volumetric method in dual sorption vessels. The same shape of isotherms introduced a common mechanism of adsorption but the amount of CO2 adsorbed on MWCNT is 2 times higher than O2 adsorption. The mass uptake of CO2 and O2 by MWCNT was found to increase with increasing pressure and decreasing temperature. The experimental data was well fitted by the Langmuir and Freundlich model isotherms considering the values of regression correlation coefficients. Following a simple acidic treatment procedure, CO2 and O2 adsorption was increased over range of pressure. The adsorbents was characterized by N2 adsorption isotherm at 77 K, Fourier transform infrared spectroscopy (FTIR), transmission electron microscopy (TEM), scanning electron microscopy (SEM) and thermogravimetric analysis (TGA). The effect of temperature and pressure on selectivity obtained from IAST demonstrated that maximum selectivity over the pressure and temperature ranges p = 0.5-5 bar and T = 298–308 K was achieved at 308 K and 5 bar. A novel molecularly imprinted polymer is prepared for dicamba as template. The method of polymer fabrication is precipitation polymerization. The produced polymers are uniform spheres in the nanoscale range. The MIP nanoparticles have outstanding removal efficiency for dicamba. Human activities, such as the ignition of fuels have increased CO2 concentrations in the atmosphere. CO2 is one of the major greenhouse gases responsible for global warming . Several technologies have been proposed to capture CO2 including chemical absorption, cryogenic separation, physical adsorption, and membrane separation. Among these techniques, chemical absorption with aqueous solution is the most famous one [2, 3]. But disadvantages of this method cause physical adsorption plays an important role in the adsorption of CO2. In the design of an adsorption based separation process, the choice of the adsorbent is very important design consideration. Pressure swing adsorption (PSA) is a very promising separation and recovery process for this type of application [4, 5]. When the carbon nanotube (CNT) was discovered by Iijima in 1991 , because of their unique properties such as uniform porosity, high effective surface area and low mass density many researches were done on this new kind of porous adsorbents . The internal and external adsorption sites of the curved nanotubes increase surface for adsorption and therefore inﬂuence the extent of adsorption . The adsorption of gases inside microporous solid sorbents is the basis of many industrial processes for gas purification and gas separation. Although multicomponent adsorption can be determined experimentally, performing experiments that systematically explore the full range of potential operating conditions for a material of interest is time consuming. As a result, many works have been done on methods to predict the adsorption of mixtures of components using only pure component isotherm ﬁts as data inputs . Among these methods, the ideal adsorbed solution theory (IAST) of Myers and Prausnitz  is widely used to predict the multicomponent adsorption equilibria in a wide variety of systems. In this study the potential of MWCNT as an adsorbent for CO2 removal from ﬂue gas (mixture of CO2 and O2) was studied. Also experimental results of CO2 and O2 adsorption by MWCNT at equilibrium state were described by Langmuir and Freundlich isotherms. Then, the ideal adsorbed solution theory in conjunction with Langmuir single-component isotherm model (Langmuir–IAS theory) was used to predict the adsorption of CO2 and O2 in the mixture and selectivity of CO2/O2 at three temperatures. 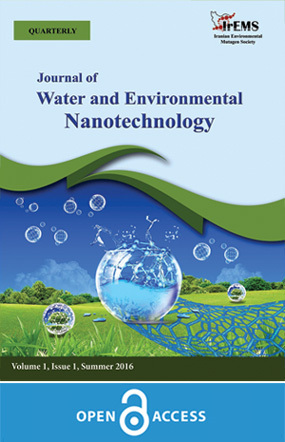 MWCNT used in this study was purchased from Alpha Nanotechnologies Company, Ltd (China) which was synthesized with chemical vapor deposition (CVD) method with purity greater than 95%. The apparent density of MWCNT was 0.063 g.cm-1. MWCNT was characterized with respect to wall thickness (single or multi-walled), diameter and length by TEM (Zeiss EM10C, Germany). Also, SEM (VEGA II LMU, Tescan, Czech Republic) was used to obtain supplementary information about the MWCNT before and after modification. The BET technique (Belsorp mini II model manufactured by BelJapan) employing N2 adsorption isotherm at 77 K was used to measure textural properties of adsorbent. The surface functional groups of sorbents were characterized by FTIR (Bruker Vertex-70, Germany). Sample discs were prepared by mixing 1mg of the samples with 300 mg of KBr and scanned in the range of 400–4000 cm-1. TGA (TGA-50, Shimadzu, Japan) was performed to study the thermal stability and dehydration characteristics of the adsorbents. The scan temperature was maintained between 40 and 1000 ⁰C at a heating rate of 10 ⁰C. min-1 in the atmosphere of air. Carbon dioxide, helium and O2 with purity of 99.99%, 99.995% and 99.99% respectively, were purchased from Technical Gas Services, UAE. The modification of MWCNT was done by adding 100 mg of crude MWCNTs to 150 mL acid solution of H2SO4/HNO3 (3:1 v/v) via sonication for 1 h. Then the solution was reﬂuxed under stirring using magnetic stirrer equipped with reﬂux condenser, thermometer and oil bath for better heat distribution at 90 ⁰C for 1 h. After cooling down to room temperature, the mixture was ﬁltered and washed with distilled water several times until pH increased to neutral value (pH 7). The carboxylated MWCNT were then dried in a vacuum drying oven at 100 ⁰C for 4 h.
The amount of CO2 and O2 adsorbed on the MWCNT were measured by using a volumetric method. Fig. 1 displays the apparatus that was designed to conduct the gas adsorption experiments. The apparatus was consisted of two high-pressure cells made of stainless steel, called as pressure and adsorption cell. They were placed in a thermostatic water bath (with working temperature range of 283-363K manufactured by Merck Company) to keep the temperature constant during the gas adsorption. The pressure cell was connected to a regulator and adsorption cell via a needle valve to control gas entrance. Gas flew from gashigh-pressure reservoir to the pressure cell via the regulator by opening the connecting valve. The adsorption experiments were initiated by opening the valves between pressure cell and adsorption cell and allowing gas entrance to the adsorption cell loaded with the adsorbent. The pressure in the system was started to drop as gas was adsorbed on the adsorbent. The equilibrium state was reached when the pressure approached to a constant value. Both cells equipped with a PT100 temperature probe and a pressure transducer that were interfaced to the computer to monitor and record system pressure. The maximum allowable pressure in the installation was 50 bars and its working temperature was in the range of 283-343K. Prior loading adsorbent into the adsorption cell, the setup was tested against any probable leak using pressurized air for 24 hours. Before each test, the adsorbent was degassed at 473K for 24 hours and the system was evacuated by vacuum pump to 0.1 mbar. Also the He gas was employed to determine the dead volume by using a calibration cell with a definite volume. By this method the exact volume of pressure and adsorption cell with their connection lines such as tubes and valves were measured. Where subscripts 1, 2, L and a stand for the initial state, final equilibrium state, pressure cell and adsorption cell, respectively. Also V is the volume, P is the pressure, T is the temperature, R is the universal gas constant, and Z is the gas compressibility factor. The N2 adsorption and desorption isotherms at 77K of the MWCNT is shown in Fig. 2. The isotherms were classiﬁed as the type II adsorption isotherm deﬁned by IUPAC which is often encountered in adsorption by nonporous materials or on materials with macropores or open voids . At low partial pressure, the adsorbed volume has increased rapidly confirming the presence of a large number of micropores in this adsorbent. The main characteristics such as BET surface area, total pore volume and mean pore diameter of this adsorbent were achieved 294 m2/g, 0.6231 cm3/g and 4.68 nm respectively. The measurement of the pore size distribution using the Barrett–Joyner–Halenda (BJH) method provided the distribution of pores in the range 2–100 nm (Fig. 3). It indicated that MWCNT used in this study have both micro and meso pores. It is obvious from Fig.4 (a) that the MWCNT had small amount of catalyst particles (as impurity). The caps of MWCNT were open; which are important for the gas adsorption because open tubes enable gas adsorption by both inside and outside of tubes . The outer diameter of adsorbent ranges from 15 to 20 nm, and the inner diameter is about 4 nm. Its length was about 30 micrometer. The SEM image for MWCNT was shown in Fig. 4 (b). It is clearly demonstrated that via Van der Waals forces the MWCNT is held together into bundles and show high degree of aggregation. It was also due to CNT length as the MWCNT showed a larger degree of entanglement. From Fig. 4 (c), the morphology of MWCNT after modification remained undamaged and more obvious ends compared to the pristine MWCNT was observed. That is because oxidative etching along the walls of MWCNT by strong acids led to fragment of MWCNTs in lengths in the range of 100–300 nm. The FTIR spectra of MWNT before and after the oxidation process is shown in Fig. 5. The peaks at 1635 cm-1 is due to the C=C bond in aromatic rings of MWCNT. The peaks at 3440 cm-1 is due to the OH band correspond to water molecules present in the KBr and unmodified MWCNT. After oxidation with strong acids, small peaks at 1714 cm-1 appeared that belong to the C=O stretching vibration of COOH groups. The peaks at 2856 and 2925 cm-1 are corresponded to the asymmetric and symmetric stretching vibrations of C-H. The C-O bond stretching can be found at 1122 cm-1 [13-15]. The TGA curve of MWCNT and MWCNT-COOH is depicted in in Fig. 6. The ﬁgure shows a slight degradation below 600 ⁰C, which is mainly due to evaporation of water molecules. Above 600 ⁰C, the rate of degradation increases and corresponds to the beginning of decomposition of carbon in MWCNT. The temperature at which onset of weight loss for the oxidized MWCNT occurred was lower than the temperature of unmodiﬁed MWCNT. That was due to the presence of the functional group bounded to the MWCNT surface . Fig. 5. FTIR spectra of MWCNT (a) and MWCNT-COOH (b). The adsorption studies were carried out at different pressures between 0 to 45 bar and 3 different temperatures, i.e. 288, 298 and 308 K. At any given temperature, the amount of gas adsorbed was a function of the pressure. Results demonstrated that gas uptake increased with an increase in pressure and a decrease in temperature. Fig. 7 illustrates the variation of O2 and CO2 equilibrium uptake by MWCNT adsorbent versus pressure at different temperatures. At higher pressures the adsorption isotherm curve of CO2 on MWCNT increases almost linearly and it seems that the CO2 uptake could be continued by increasing pressure, whereas the adsorption isotherm curve of O2 on MWCNT leads to saturation at high pressure. The amount of CO2 adsorption is more than O2 adsorption because of its large quadrapole moment and high degrees of polarizability. In other word, the interactive forces between CO2 and MWCNT are bigger than those, the interactive forces, for O2. In this study the maximum amount of CO2 and O2 uptake by the MWCNT adsorbent was obtained 16.69 mmol.g-1 and 8.65 mmol.g-1 respectively at 288K and 50 bar. The results confirmed that by decreasing temperature to less than 288K and increasing pressure to above 50 bar, higher amounts of gas absorption can be achieved. Fig. 7 CO2 and O2 adsorption isotherm for MWCNT at diﬀerent temperatures and nonlinear ﬁt of experimental data with Langmuir and Freundlich models. Where qe is the amount of gas adsorbed per unit mass of MWCNT (mmol.g-1); qm is the maximum amount of gas adsorbed (mmol.g-1) and KL is KL=ka/kb, ka and kb are adsorption and desorption constants, respectively. Where KF is Freundlich constant and 1/n is the heterogeneity factor. For n >1, adsorption is favorable. The Freundlich isotherm indicates reversible adsorption process [18, 19]. Isotherm parameters were obtained through a nonlinear fit of experimental data with model isotherm equations (Fig. 7). Table 1 shows the values of Langmuir and Freundlich isotherms parameters. The comparison of the R2 values from Table 1 shows that both Langmuir and Freundlich isotherm models yield better fit to the experimental data. With increasing the temperature, Langmuir parameters (qm and KL) decreased indicating that the aﬃnity between both gases and adsorbent had an inverse relationship with temperature confirming an exothermic nature of the adsorption process. As the temperature increased from 288 to 308 K, the KF value of the CO2 and O2 adsorbed by MWCNT decreased. The effect of acid treatment on CO2 and O2 adsorption was studied at different pressures up to 40 bars and temperature of 298 K. Fig. 8 depicts the CO2 and O2 adsorption isotherm of acid-treated MWCNT. The experimental results indicate that the modified adsorbent shows better adsorption compared to pristine one. Acid modification of adsorbent can eliminate effectively impurities such as the catalyst particles and amorphous carbon. Therefore the purity of CNT is increased and defects and cavities is formed which originate from removing impurities. Also, acid treatment opened closed-caps of MWCNT, which is useful for gas storage. Nevertheless, the treatments of MWCNT could not have great effects on the CO2 and O2 adsorption capacity (Fig.8) due to the covering the ends and sidewalls of MWCNT with various oxygen containing groups (mainly carboxyl groups) after pretreatment with concentrated acids. Similar trends in equilibrium adsorption of both gases on MWCNT and COOH-MWCNT verifies that the morphology of MWCNT remained undamaged after acid treatment. Fig. 8. The effect of acid modification in CO2 and O2 adsorption at 298 K.
P0 CO2, P0 O2, xCO2 and xO2 determined, the following equations are employed to calculate qCO2, qO2, qt and adsorption selectivity S.
where and are the mole fractions in adsorbed phase and and are the mole fractions of CO2 and O2 in gas phase. The adsorption isotherms of CO2/O2 mixtures were predicted by IAST at three temperatures for 50% O2 in the bulk phase and showed in Fig. 9. From Fig. 9, it can be concluded that if a CO2/O2 mixture is put into contact with this MWCNT, CO2 would be adsorbed preferentially leading to an enrichment of O2 in the gas phase. The CO2/O2 binary isotherms present behavior similar to the pure gas isotherms, with CO2 as the dominant adsorbate. The predicted CO2 and O2 binary isotherms decreased relative to the pure component isotherms. The selectivities for three different temperatures were predicted for 50:50 gas-phase CO2/O2 mixtures using IAST and was shown in Fig. 10. In all temperature, with increase in pressure or composition of the CO2, selectivity increases. At higher compositions of CO2 (lower composition of O2), due to the lateral interactions between the adsorbed molecules of CO2, the selectivity increased . With increasing the temperature from 288 K to 298 K the selectivity was reduced from 1.81 to 1.48 for 50:50 gas-phase and pressure of 5 bar. Wherease by increasing the temperature from 298 K to 308 K the selectivity was increased from 1.48 to 1.83 for same condition. Actually, based on the two main mechanisms for adsorption selectivity which are kinetic separation and thermodynamic separation, CO2 has smaller kinetic diameter, higher quadrupole moment and higher polarizabiltiy compared to O2which in many cases result in stronger interaction with pore surface of the adsorbent. These data indicate that MWCNT can be successfully applied in CO2/O2 separation. Experimental isotherm of pure CO2 and O2 adsorption was determined by the measurement of equilibrium uptake of CO2 and O2 at pressure range of 0–40 bar and at different temperatures. Increasing the temperature from 288 to 308 K, decreased the gas capacity for both components due to the exothermic interaction. Acid treatment increased the amount of CO2 and O2 capture over entire range of pressure for MWCNT without any real damage and destruction on the morphology of MWCNT. The CO2/O2 binary isotherms obtained from IAST present behavior similar to the pure gas isotherms, with CO2 as the dominant adsorbate. According to the pure gas isotherm data on MWCNT, carbon dioxide is adsorbed much more than oxygen. The selectivity predicted from IAST indicates that MWCNT used in this study is selective to carbon dioxide. Both temperature and pressure are very important for selectivity. With increase of CO2 concentration in feed gas, the selectivity of CO2 increased. Maximum selectivity over the pressure and temperature ranges p = 0.5-5 bar and T = 298–308 K was achieved at 308 K and 5 bar. The results indicate that MWCNT can be successfully applied in CO2/O2 separation. 1. Samanta, A., A. Zhao, G.K. Shimizu, P. Sarkar, and R. Gupta, 2011. Post-combustion CO2 capture using solid sorbents: a review. Industrial & Engineering Chemistry Research, 51(4): 1438-1463. 2. Mondal, M.K., H.K. Balsora, and P. Varshney, 2012. Progress and trends in CO2 capture/separation technologies: a review. Energy, 46(1): 431-441. 3. Starr, K., X. Gabarrell, G. Villalba, L. Talens, and L. Lombardi, 2012. Life cycle assessment of biogas upgrading technologies. Waste Management, 32(5): 991-999. 4. Sheikh, M.A., M.M. Hassan, and K.F. Loughlin, 1996. Adsorption equilibria and rate parameters for nitrogen and methane on Maxsorb activated carbon. Gas separation & purification, 10(3): 161-168. 5. Grondein, A. and D. Bélanger, 2011. Chemical modification of carbon powders with aminophenyl and aryl-aliphatic amine groups by reduction of in situ generated diazonium cations: applicability of the grafted powder towards CO2 capture. Fuel, 90(8): 2684-2693. 6. Cao, D. and W. Wang, 2007. Storage of hydrogen in single-walled carbon nanotube bundles with optimized parameters: effect of external surfaces. International Journal of Hydrogen Energy, 32(12): 1939-1942. 7. Reddy, A.L.M. and S. Ramaprabhu, 2008. Hydrogen adsorption properties of single-walled carbon nanotube-Nanocrystalline platinum composites. International Journal of Hydrogen Energy, 33(3): 1028-1034. 8. Su, F., C. Lu, W. Cnen, H. Bai, and J.F. Hwang, 2009. Capture of CO2 from flue gas via multiwalled carbon nanotubes. Science of the total environment, 407(8): 3017-3023. 9. Mofarahi, M. and F. Gholipour, 2014. Gas adsorption separation of CO2/CH4 system using zeolite 5A. Microporous and Mesoporous Materials, 200: 1-10. 10. Myers, A. and J.M. Prausnitz, 1965. Thermodynamics of mixed-gas adsorption. AIChE Journal, 11(1): 121-127. 11. Tsai, W., J. Yang, C. Lai, Y. Cheng, C. Lin, and C. Yeh, 2006. Characterization and adsorption properties of eggshells and eggshell membrane. Bioresource technology, 97(3): 488-493. 12. Mishra, P., S. Mekala, F. Dreisbach, B. Mandal, and S. Gumma, 2012. Adsorption of CO 2, CO, CH 4 and N 2 on a zinc based metal organic framework. Separation and Purification Technology, 94: 124-130. 13. Vuković, G., A. Marinković, M. Obradović, V. Radmilović, M. Čolić, R. Aleksić, and P.S. Uskoković, 2009. Synthesis, characterization and cytotoxicity of surface amino-functionalized water-dispersible multi-walled carbon nanotubes. Applied Surface Science, 255(18): 8067-8075. 14. Ma, P.C., J.-K. Kim, and B.Z. Tang, 2006. Functionalization of carbon nanotubes using a silane coupling agent. Carbon, 44(15): 3232-3238. 15. Jin, S.H., Y.-B. Park, and K.H. Yoon, 2007. Rheological and mechanical properties of surface modified multi-walled carbon nanotube-filled PET composite. Composites Science and Technology, 67(15): 3434-3441. 16. Murugesan, S., K. Myers, and V.R. Subramanian, 2011. Amino-functionalized and acid treated multi-walled carbon nanotubes as supports for electrochemical oxidation of formic acid. Applied Catalysis B: Environmental, 103(3): 266-274. 17. Chowdhury, S., R. Mishra, P. Saha, and P. Kushwaha, 2011. Adsorption thermodynamics, kinetics and isosteric heat of adsorption of malachite green onto chemically modified rice husk. Desalination, 265(1): 159-168. 18. Sayğılı, H., F. Güzel, and Y. Önal, 2015. Conversion of grape industrial processing waste to activated carbon sorbent and its performance in cationic and anionic dyes adsorption. Journal of Cleaner Production, 93: 84-93. 19. Ong, S.-A., L.-N. Ho, Y.-S. Wong, and A. Zainuddin, 2013. Adsorption behavior of cationic and anionic dyes onto acid treated coconut coir. Separation Science and Technology, 48(14): 2125-2131. 20. Chen, H. and D.S. Sholl, 2007. Examining the accuracy of ideal adsorbed solution theory without curve-fitting using transition matrix Monte Carlo simulations. Langmuir, 23(11): 6431-6437.